This is Zimbabwe's first ballot without former president Robert Mugabe's name on the candidate list since the country gained independence in 1980. Mugabe, who initially served as prime minister, became the executive president in 1988 and was ousted in a coup by his own political party, Zanu-PF, in 2017. Former Mugabe ally and vice-president Emmerson Mnangagwa has been president since Mugabe's removal. He is now one of the main contenders for the position of president, facing off with Nelson Chamisa, opposition party MDC leader. 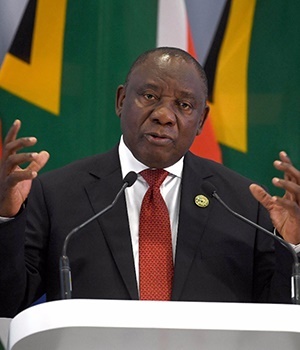 "This is the most historic election process and as South Africa, and indeed the ANC, we wish them the very best," the ANC president told journalists on Monday. He was speaking ahead of the ANC's national executive committee lekgotla currently underway in Irene, Centurion. The meeting is set to discuss and assess the performance of government under the leadership of the party since the beginning of the year. It's the second meeting of its kind, with the first lekgotla having taken place in January. At that meeting, the party gave its government an agenda and goals it wanted to be met this year. Read more: No turning back for Zimbabwe, but is it the start of real change? "It means that the people of Zimbabwe are determined to ensure that they install a government that will be representative of all the people of that country," he remarked. "As South Africa we wish them the very best and we look forward to going to the inauguration once the election results have been announced. Everything seems to be going well and we are very pleased as a neighbour of Zimbabwe," concluded Ramaphosa.